In many ways, Woody Guthrie has become the forgotten legend of the music industry. While the outpouring of “millennium” lists brought attention to a number of entertainers, little was paid to Guthrie, the man who laid the groundwork for virtually every musician since. Everyone from Bob Dylan to Billy Joel has paid homage to him, yet much of his best work is unfamiliar to the public. Thankfully, Smithsonian Folkways did its part to raise awareness by releasing four remastered collections, all recorded by Folkways founder Moses Asch during the 1940s. The first in the collection, subtitled This Land is Your Land, serves as a general greatest hits album. Its 27 tracks sample all Woody’s styles, from patriotic anthems to fun love songs to politically charged tunes. The album is required listening for Guthrie fans and a great crash course for those unfamiliar with him. 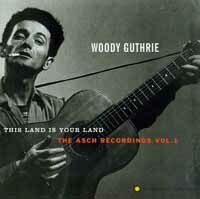 The album opens with “This Land is Your Land,” probably his most famous song. A simple request for the equality of the working man, it appears on this collection in three versions, each with slightly different lyrics, though the familiar chorus remains constant. “Car Song” is a fun tune about a car ride, with Woody making a number of verbal sound effects. “Talking Fishing Blues” is a pure talking blues, a deceptively difficult style that involves speaking a metered story over a basic guitar sequence. Here he sings about an unusual fishing trip, while “Talking Hard Work” applies his blue-collar work ethic to the pursuit of a woman. “Why, Oh Why?” is just a light, nonsensical ramble. But all these tracks demonstrate Guthrie’s ability to make music for the sheer enjoyment of it. While all these themes are present in his work, Guthrie is best known as a voice for the voiceless. “Picture From Life’s Other Side” shows the downtrodden as pictures in an art gallery, from the suicide of an outcast to a man unknowingly killing his own brother. “Pastures of Plenty” recounts the thankless work of the migrants who “come with the dust and go with the wind.” “Ramblin’ Round” and “Hobo’s Lullaby” reflect his early career, traveling the country as a homeless folk singer. By combining all these styles, This Land is Your Land creates a perfect sampler of Guthrie’s work. Every song on the album is excellent and the music holds up exceptionally well over time, as many of the issues Guthrie championed continue to be sources of contention. The remastered sound quality is surprisingly good for tracks recorded as much as 60 years ago. Guthrie album releases are a recent phenomenon, as most of his work was passed down orally or through sheet music. With these Folkways releases, folk’s greatest prophet can finally reach a wider audience.